Sponsored by: Coxsackie’s What a Hoot! 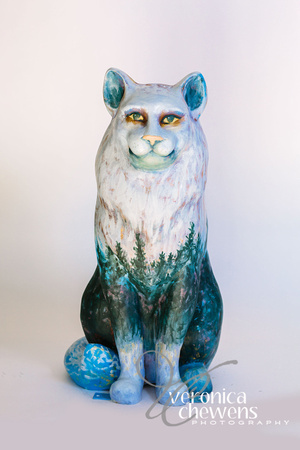 Description: This Catskill Ambassador Cat will be visiting Coxsackie’s “What a Hoot! Community Art Project this summer. 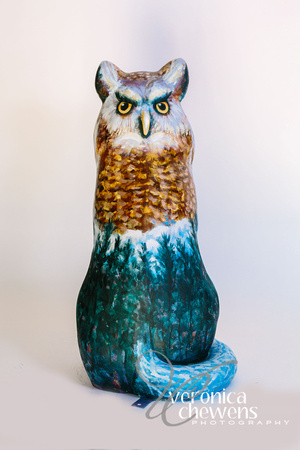 PURR-Owl is a cat and an owl that will be prowling the streets of Coxsackie and will return to Catskill for the Cat’s Meow Auction & Gala in September. About the Artist: Enrico Scull is a graphic designer, painter and musician who has made Catskill NY his home since the late seventies. That was a time when the area was waking up from a long “Van Winkle” and as it awoke, it rediscovered the arts of Cole and Church and the Greene County Council on the Arts was born. As a graduate of Cooper Union in NYC and a Peace Corps volunteer in the foreign tourism trade, Enrico brings a lot of creative solutions to the Heart of Catskill Association. Along with his wife, Elaine, Enrico was president and creative designer of Hudson River Graphics, a five person studio they ran for thirty years. During that time, the firm garnered over 21 awards for tourism promotion and graphics excellence. The firm produced posters, brochures, magazines, videos, and radio advertising and was often imitated but never equaled. Enrico continues to create brochures and design solutions for a select clientele.